I’m pretty sure Thomas Rhett has it all. At the age of 25 he has already established himself as one of Nashville’s next big stars, and anticipation was high at the beginning of the year for the release of his sophomore album Tangled Up – generating a ton of interest and racking up impressive presales. Having already penned records for the likes of Jason Aldean, Lee Brice and Florida Georgia Line, Rhett has established himself as a great song writer; a trait no doubt passed down from his Father Rhett Atkins who is also an acclaimed country music singer/songwriter. Rhett has continued the same formula that worked so well for him in his debut album ‘It Goes Like This’, writing the majority of the songs and providing a host of up-tempo tracks which certainly dabble with other genres to say the least. Lead single ‘Crash and Burn’ is Rhett’s fourth to reach number one in the country airplay chart (and his fastest to do so), and you can see why. It’s catchy, it’s energetic and it’s…..not country music. But that’s ok because it’s 100% going to get stuck in your head and you’ll definitely have it on repeat. This song is easy on the ears and the key focus is on rhythm, making it a solid song that will definitely make you want to hear more of what Rhett has to offer. Right now, the lines of country music are probably as blurred as they have ever been. We have Florida Georgia Line dividing opinion with the newly labelled ‘bro country’, Sam Hunt breathing new life into the country music scene mixing in an R&B/pop influence and Brantley Gilbert has developed a huge fans base with his take on country rock. With this album Thomas Rhett is definitely going to get people talking too. Even with his genre-stretching lead single, the album itself still comes as a bit of a surprise. It reaches deep into other genres for inspiration and fans still deeply rooted in country may not find this to be their cup of tea. That’s not to say that this album doesn’t include some great country songs though. In my opinion Rhett excels when he returns to his staple country sound. The songs ‘The Day You Stop Lookin’ Back’ and ‘Die A Happy Man’ are arguably two of the strongest songs on the album. With little going on in the background, and often just Rhett and his acoustic guitar, Rhett is allowed to shine (and we are allowed to get our breath back before the next tempo change). Apparently, Rhett’s wife, high school sweetheart Lauren Gregory, asked him to write a song for her as good as Tim McGraw’s ‘Just To See You Smile’ – let’s just say Rhett delivered with ‘Die A Happy Man’. This song is sure to be a hit, and by releasing it as his next single, appeases the critics who may have been sceptical about this album; showing his fans that he isn’t ready to leave the country music scene just yet. Tangled Up also comprises two collaborations. The first, ‘I Feel Good’, featuring Lunchmoney Lewis (you weren’t expecting that were you! ), is another up tempo hit which again lends its hand to a more poppy sound and doesn’t have any deeper meaning to it other than ‘I feel good today, can’t nobody bring me down’. But the rap Lunchmoney provides does seem to flow with the song and fits nicely to produce another catchy well rounded track .His second collaboration seems a lot more natural. ‘Playing With Fire’, featuring the uber-talented Jordin Sparks, is about two people who are in a toxic relationship, yet somehow still keep ‘playing with fire’ because they love the way they make each other feel. This song is brilliant. I have to admit I was shocked when I heard that Jordin Sparks would be featuring on this album, however her voice seems to compliment Rhett’s perfectly to produce an effortlessly wonderful love ballad. Other songs that you should definitely give a listen to on this album include ‘Like It’s the Last Time’ and ‘Learned It From The Radio’. The first is a song that Rhett wrote with his Father and allows Rhett to return some-what to his country roots. The strong use of drums and electric guitars provide a good effect to this ‘party like it’s the last day of your life’ type of song. I would love to hear this song live because I think with the strong beat and anthemic chorus it would leave a lasting impression. Learned It From The Radio is the final song on the album. Lyrically, it is far more country than most of the album. The track provides a fitting end to a well rounded album which is easily the most entertaining of the year and should definitely be purchased. Overall, this album reminds me of when Taylor Swift was turning pop a few years ago and Scott Borchetta seemed to deliberately add a country twang here and there so that it would still fall under the country music bracket. Rhett is clearly talented and it’s obvious that through his Father he has had a solid foundation to start his career in country music. However, based on this album I don’t feel that his heart may truly lie with this genre. It is very friendly with the Nashville sound and from a country music fans perspective songs like ‘Die A Happy Man’, ‘Learned It From The Radio’ and ‘The Day That You Stop Lookin’ Back’ are where Rhett performs best and is allowed to shine. That’s not to say that the other songs on the album aren’t worth listening to though. This is an extremely fun album and in my opinion it is very well rounded with no real weak links. 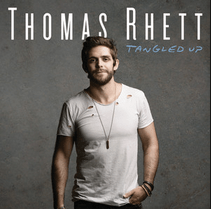 I love how every track seems to have a different vibe to it and its high tempo and lively beat in songs such as ‘Vacation’, ‘South Side’ and ‘T-Shirt’ are sure to get people wanting to know more about Thomas Rhett and who knows, maybe this album may help bridge the gap for those who have never liked country music. Rhett debuts across the UK in March next year as part of the Country2Country festival and this album is sure to get people on their feet and wanting to hear more. The great thing about country music is that it’s always evolving. It’s always flirtatious with other genres and crosses boundaries like no other type of music can. Rhett may split opinions with this album at times as the country music twang is almost impossible to hear. It’s important to remember that we are in the middle of change. Artists like Sam Hunt and Florida Georgia Line have charged onto the music scene and really livened things up, leading a period of Bro Country to really divide opinion. This album will certainly not be everyone’s cup of tea. Some will embrace the change and soak up this fun loving album, others will not get through the first song. My opinion? Make the most of it. This album may not be country music, but as long as it’s good music does it matter?